The Leisure Travel Van is a superbly constructed RV, proudly manufactured in Winkler, Manitoba, Canada. For over 45 years, Leisure Travel has been producing quality RV's that are both elegant and refined. They have a reputation of producing LTV Free Spirit Class B some of the finest recreational vehicle products on the market. In a world often driven by low prices, buyers wanting a quality product are sometimes left with few choices. Quality and craftsmanship are not a thing of the past at Leisure Travel Vans. At Leisure Travel, they believe it's the little things that make the biggest difference. Double screwed face framing, number-coded wiring and powder coated chassis components, and cabinetry that is more like high-end furniture than it is something found in an RV are just a few examples of Leisure Travel Vans commitment to excellence. Leisure Travel is going beyond the norm, and exceeding customer satisfaction by delivering a superior product everyday. It's all about quality...not quantity. 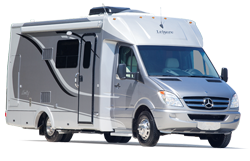 Leisure Travel was the first North American RV manufacturer to produce a Class B Motorhome on the Sprinter Chassis, the fiberglass molded Leisure Travel Van Serenity wide body Serenity, and the first Murphy Bed in a class B+ Motorhome all point to the leader in Class B innovations. The Leisure Travel Unity 24MB is among the most popular vehicles on the market. With the innovative Murphy bed, the Leisure Travel delivers a compact motorhome with a large bathroom and full size bed. September of 2012, Leisure Travel Van introduced the first Mercedes Sprinter van camper with a slide out and full bath; the Free Spirit SS. 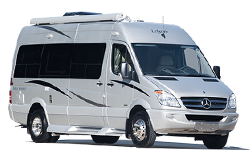 Fretz RV is proud to represent such an outstanding product as the Leisure Travel Van line-up; the Leisure Travel Van Flex, Free Spirit SS, the Unity, Serenity, Libero, and the new Leisure Travel Van Wonder. Please stop in or contact us to learn more about the Leisure Travel Van series of recreational vehicles. View our New Leisure Travel Van Motorhomes for sale, or feel free to browse our entire New or Used RV inventory. Check out all of our RV videos in full full size here.